Web hosting donated by Colorado Firecamp. The communities of Alpine and St. Elmo are located in upper Chalk Creek Canyon in Chaffee County. These rural mountain communities are accessed by heading west on county road 162 from Hwy 285 in Nathrop. 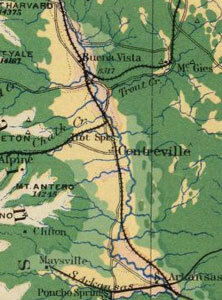 Both town sites are historic mining towns and date to 1879 and 1889 respectively. Although few original buildings still remain in Alpine, the town of St. Elmo includes 38 structures that are included in the St. Elmo Historic District listed on the National Register of Historic Places. Over 70,000 visitors travel CR 162 to visit St. Elmo during a one year period. There are approximately 140 property owners in the two communities which are surrounded by USFS land. In the Chaffee County CWPP subdivision wildfire risk assessment Alpine was given the highest rating of extreme and St. Elmo was rated as very high. The vegetation type is mixed conifer forest with juniper shrubs, aspen, Douglas fir, ponderosa pine and some lodge pole pine trees. Significant improvement through the efforts of property owners in wildfire mitigation and fuel reduction have taken place for many years with an extensive cleanup effort of the historic Alpine Cemetery in 2006. Then in the summer of 2007 the community of Alpine experienced a catastrophic debris slide which caused significant property damage and totally covered the cemetery. The following plan has been created for the proactive operations, protection and safety of both Alpine and St. Elmo property owners. See attached maps for details of the communities. The land surrounding both the communities of Alpine and St. Elmo is all USFS land. In the Chaffee County CWPP a risk assessment was done for the communities of Alpine and St. Elmo. In the Chaffee County CWPP subdivision wildfire risk assessment Alpine was given the highest rating of extreme and St. Elmo was rated as very high. Both communities have shown a risk of mud slides. The communities of Alpine and St. Elmo are located 15 to 17 miles west of Chaffee County Fire Protection District Station #2 located in the Town of Nathrop. This is the closest fire station to Alpine and St. Elmo. Station #2 to has a type 6 brush truck with 200 gallons, a tender and a type 1 fire engine with four wheel drive. Alpine and St. Elmo both have dry hydrants located in their communities. Go to firewise .org for educational material on the reductions of structural ignitability. Information below is from Firewise “Be Firewise Around Your Home”. Firewise recommendations for reduction of fuels around the home ignition zone: The Home Ignition Zone begins with at least 30 feet of space immediately around the home and extending out as far as 100 to 200 feet depending on the characteristics of the surrounding forests or grasslands. Creating and maintaining the Home Ignition Zone reduces or eliminates ignition hazards presented by vegetation (by thinning or spacing, removing dead leaves and needles and pruning shrubs and tree branches) and combustible construction (wooden porches, decks storage sheds, outbuildings, swing sets and fences). Lean clean and green landscaping: With Firewise landscaping, you can create survivable space around your home that reduces your wildfire threat. Prune large trees so that the lowest branches are at least 6 to 10 feet high to prevent a fire on the ground from spreading to the tree tops. Within the Home Ignition Zone, remove flammable plants that contain resins, oils, and waxes that burn readily: ornamental junipers, red cedar, and young pine. A list of less-flammable plants can be obtained from your local state forester, forestry office, county extension office or landscape specialist. Fire resistant roof construction: Firewise roof construction materials include Class-A asphalt shingles, metal, slate or clay tile, and concrete products. Thin inclusion of a fire-resistant sub roof adds protection. Make a periodic inspection looking for deterioration such as breaks and spaces between roof tiles. Keep the roof, gutters, and eaves clear of leaves and other debris. Make sure under-eave and soffit vents are as close as possible to the roof line. Box in eaves, but be sure to provide adequate ventilation to prevent condensation and mildew. Fire resistant attachments: Attachments include any structure connected to your home, such as decks, porches, or fences. If these items attached to a home are not fire-resistant, then the home as a whole is vulnerable to ignition. Fire resistant construction: Wall materials that resist heat and flames include brick, cement, plaster, stucco, and concrete masonry. Tempered and double-pane glass windows can make a home more resistant to wildfire heat and flames. A disaster plan: The time for any emergency is prior to the event. Take time to discuss with your family what actions you will take. Post emergency telephone numbers in a visible place. Leave before it is too late. Decide where you will go and how you will get there. Have tools available (shovel, rake, axe, handsaw, or chainsaw). Maintain an emergency water source. Have a plan for your pets. Practice family fire drills. Emergency access: Identify your home and neighborhood with legible and clearly marked street names and numbers. Include a driveway that is at least 12 feet wide with a vertical clearance of 15 feet and a slope of less than 5 percent to provide access to emergency vehicles. Individual lots -Inform and support individual property owners through reduction of wildfire risks and improvement of wildfire response safety. Continue wildfire education of individual property owners and encourage them to reduce on-site fuel throughout their property, and to develop safer more defensible perimeters around houses and other structures. Information from the firewise.org web site will be one of the sources for educational information. Alpine and St. Elmo Community - Revise existing maps with updated homeowner status and contact numbers and distribute the map to local fire and emergency teams. Identify evacuation staging areas/landing zones, develop drill evacuation plans. Neighboring Lands - develop a coordinated wildfire mitigation effort with Chaffee County, the Colorado State Forest Service, the US Forest Service (USFS), and adjacent private property owners. Request a meeting with USFS fire staff to discuss future fuels reduction work on USFS public land adjacent to Alpine and St. Elmo. In addition discuss the coordination of USFS to maintain a safety fire exit corridor along County Roads 292 and 162 that includes deadwood management. After the mud slides it is desired to have restoration of the cemetery grounds (USFS land). Funding - To seek and expand Alpine and St. Elmo resources and potential funding for fuel reduction and wildfire mitigation efforts. Slash Disposal - Develop options and additional support for disposal of slash. We would like support from the Board of County Commissioners to seek solutions to the slash disposal problem in the county. Chaffee County Fire Protection District - Request Chaffee County Fire Protection District to identify and enhance assess points near water sources where the fire department could place their portable water pumps. Assure coordinated effort by Chaffee Count Fire Protection District and Alpine to clean/maintain Alpine Lake dry fire hydrant and repair and clean/maintain St. Elmo Chalk Creek dry fire hydrant. Research, evaluate and potentially pursue options for cistern water storage or install additional dry hydrants or firefighting equipment with coordinated training provided by Chaffee County Fire Protection District. The suggested and preferred method of treatment for the creation of defensible space is having CSFS or the trained community members in the community flag the trees for removal. The homeowners do the work themselves or contract out the work. Have a central location to pile the slash and then hire a contractor to masticate the pile and then haul off the material. 2008 State Fire Assistance (SFA) Fuels Reduction Project for the Town of Alpine and the Town St. Elmo. In the summer of 2009 SFA grant money was be spent to do fuels mitigation work around the homes in the Town of Alpine and St.Elmo. This was a $23,600 project and several lots were treated with the funding. Lots were marked by CSFS, individual homowners performed fuels reductions work and a contractor was hired to chip and remove the slash. In the 1990’s citizens from Alpine and St. Elmo financially contributed to the installation of dry fire hydrants.